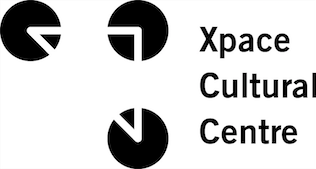 Xpace Cultural Centre, 2-303 Lansdowne Ave. In light of recent political events, we are called together to revise, reconsider and re-evaluate where we have come from and our shared history. It is with urgency that we come together with warmth and understanding and embrace our diverse and intersectional identities and perspectives. As the season changes, thoughts are brought to fall harvest and the cold months of winter to come. Join us for a special talk by artist and educator Lisa Myers from 5-7pm who will discuss how food and environmental ethics are interconnected. She will explain how food has a material and symbolic life with connections to place, culture and history as well as the use of food in her art practice. In response to North American Thanksgiving, join us for a FREE warm homemade meal hosted by Xpace Cultural Centre with a guided discussion and sharing circle facilitated by INVC’s Shawna Howe and Critical Soup organizers, Dana Prieto, Amanda Robertson-Hebert and guest Sean Sandusky as we deconstruct the selective account of our modern Thanksgiving narrative that marks generations of colonizing people, land and nature. Share with us your cultural traditions, favourite foods, customs, stories of gratitude or frustration, hopes or fears in an inclusive environment intended for collective healing and community building. Decolonial Soup will open with a smudging ceremony and traditional song facilitated by OCAD University’s Indigenous counselor, Shawna Howe, BA, MSW. FREE with registration! Register at xpace.eventbrite.com. Space is limited! Our event is committed to maintaining an anti-oppressive, queer positive environment, welcoming marginalized, racialized and indigenous folks. Accessibility: Xpace’s entrance is at street level with no steps. The galleries, office and gender neutral washrooms are all located on the 1st floor. Service animals may accompany visitors at any time. 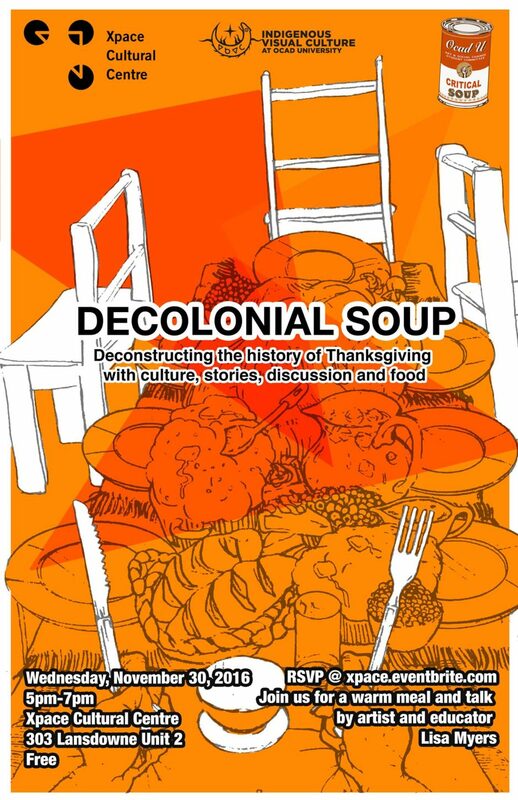 Decolonial Soup has been organized by the collaborative efforts of Indigenous Visual Culture at OCAD University, student-run initiative Critical Soup and Xpace Cultural Centre. Critical Soup is an OCAD U student-run initiative opening spaces to share food and conversations about art and social justice.